Metro Security Screens are designed for both commercial and residential applications. Metro Security Screens are now installed everywhere from HUD housing and public housing developments to schools and high end homes. We can help you protect your home, business or any development with our security screens. Security screens are used to protect the windows from vandalism, golf balls and any other objects that could break your window. In addition security screens are heavy duty so you will not be replacing them from abuse like a traditional screen. Call today and see how a security screen might work for your application. Metro Security Screens are often specifically requested by architects and housing authorities. You will be surprised at our competitive pricing when compared to other companies with similar products. Do you need a quote on a large project? Or do you need assistance from a sales rep on your special project? Please contact us for pricing and assistance. A security screen installs to an existing window. They are available fixed or operable depending on if you need to be able to open for cleaning or to be able to get out in an emergency. 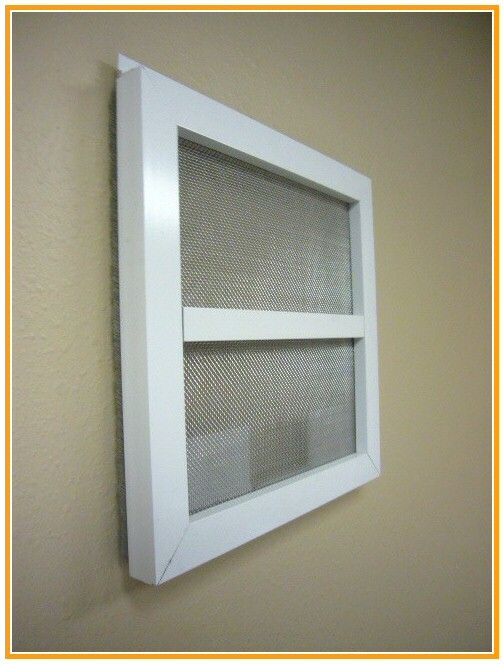 Security screens look similar to an insect screen but in addition to providing insect protection they provide durability and security. They have a strong stainless steel wire installed which is available in different meshes depending on how tuff you need the screen to be. Security screens are made with a heavy duty extruded aluminum or steel frame depending on the model of screen you choose. There are different frame sizes and styles to meet your specific needs. Below is an overview of the most common types of security screens we offer. Please contact us if you do not see what you need. We ship to all locations in the USA and work with all types of commercial and residential jobs. The standard frame colors for the security screens are white, bronze and silver. In addition we do have other color options available depending on the model you choose to go with. We of course can paint them to any color for an additional charge. The stainless steel mesh is silver but is also available in a powder coated black finish. 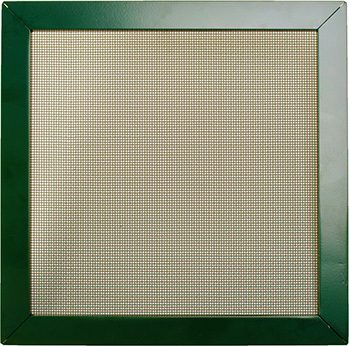 Our Safety screens come in a wide array of frame The standard frame colors for the security screens are white, bronze and silver. In addition we do have other color options available depending on the model security screen you choose. We can custom paint the frame just about any color for an additional charge. Standard stainless steel wire diameter options are .018, .023 and .028. The stainless steel mesh comes standard in silver but is also available in a powder coated black finish. Our Safety Screens come in a wide array of frame and mesh colors. With the Safety Screens we can powder coat the frame and wire the same color.and mesh colors. We can powder coat the frame and wire to be the same color for the safety screens. Security Screens are available with a piano hinge and latching system. This allows the security screen to be opened for egress or ease of window cleaning. Another option is to use a key lock instead of the spring loaded latch. 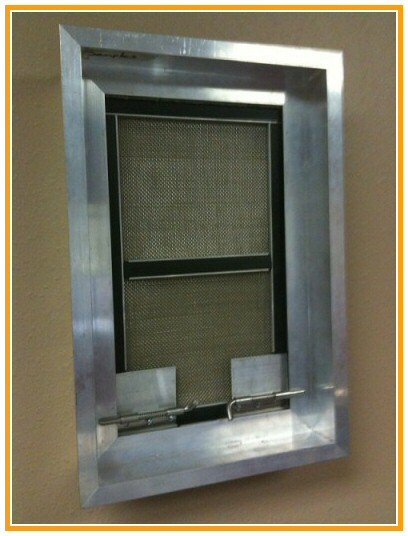 We offer a hinged security screen with a 3" master or sub frame. This master frame is also available in a 2" design. This style security screen has a 5/8" lip around the perimeter for ease of screw on installation to the existing primary window. This is the inside view of our security screen. Here we see the spring loaded latch and protective guard to prevent intrusion from the outside of the window. Simply pull on the latch and push out on the screen for ease of opening. 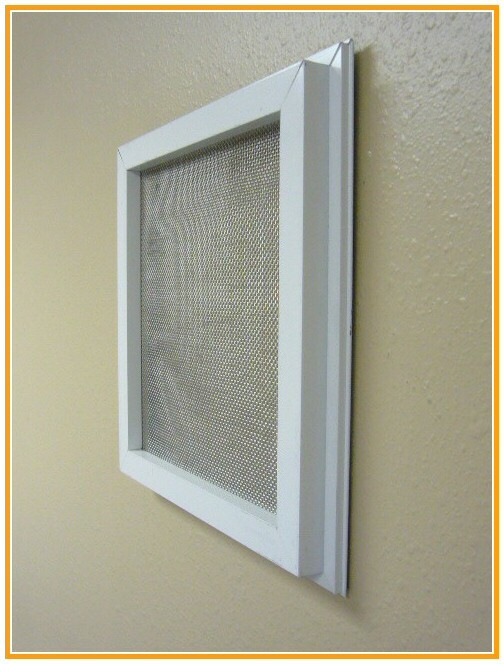 Click to Enlarge A hinged security screen is also available without the master frame. A piano hinge is attached directly to one side of the security screen frame. The same latching system is also attached to the opposite side. The latch can be made to catch onto your existing primary window. A section of angle aluminum may be attached to your primary window to act as a catch for the spring loaded latching bolts. If you can use the security screen without the master frame then you can save money. 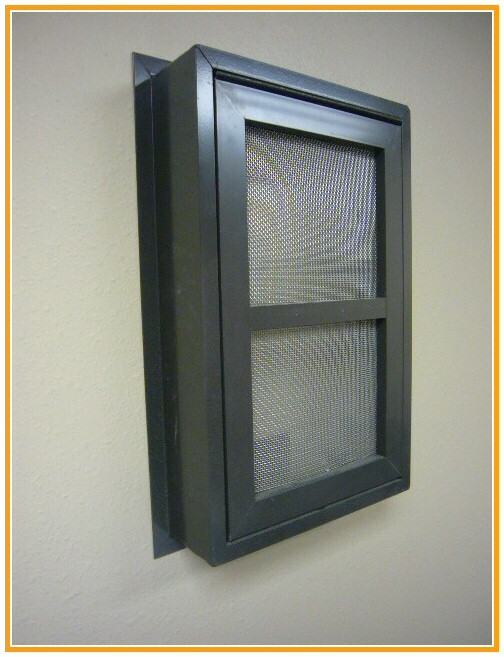 Our fixed panel security screens are used where you will not be opening your primary window. This style is great for picture windows and store front windows on businesses. This is also ideal for use on screen doors to add security. We have three options for the fixed panel security screens. This panel has a ½" lip around the entire perimeter of the frame. This allows for ease of screw on installation. The lip is 3/8" thick to allow for a secure installation. This panel has a ½" lip around the entire perimeter of the frame. This allows for ease of screw on installation. The lip is about 1/16" thick allowing for a very flush install. This style of security screen we refer to as our safety screen. It is a good alternative for a standard window screen that you need to be able to stand up to damage. It would be ideal for rentals, apartments, hotels, schools and any high traffic areas where the screens tend to get damaged. This Metro Security Screen is also made of extruded aluminum that is ½" x 1". The stainless steel wire is a 12 x 12 mesh available in .018, .023 and .028 wire diameters. The frame profile is ½" thick and 1" wide. The frame and mesh come in a wide array of colors options. This security screen is available with no hardware, tension springs or latches. Available Finishes For Safety Screens. 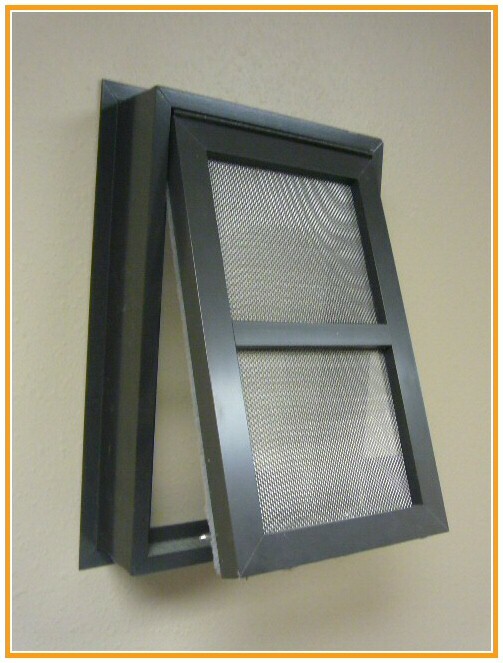 Metro Security Screens can be either top hinged, side hinged or middle hinged to accommodate window air conditioners. We also build a fixed panel Security Screen that has a continuous lip or fin around the perimeter for ease of attachment. All extrusions are made from 6063 T5 aluminum. 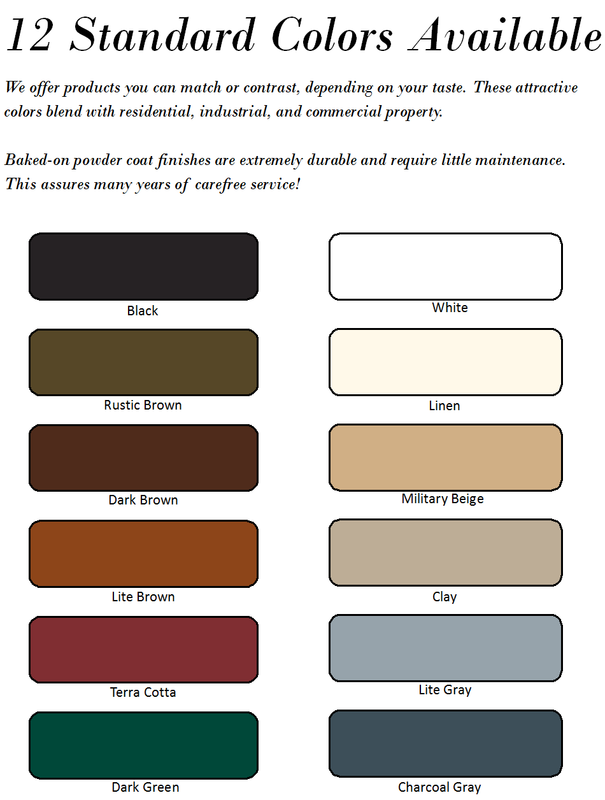 Standard colors are White, Bronze and Silver. Other colors can be matched if needed. Stainless steel wire is standard in all screens. 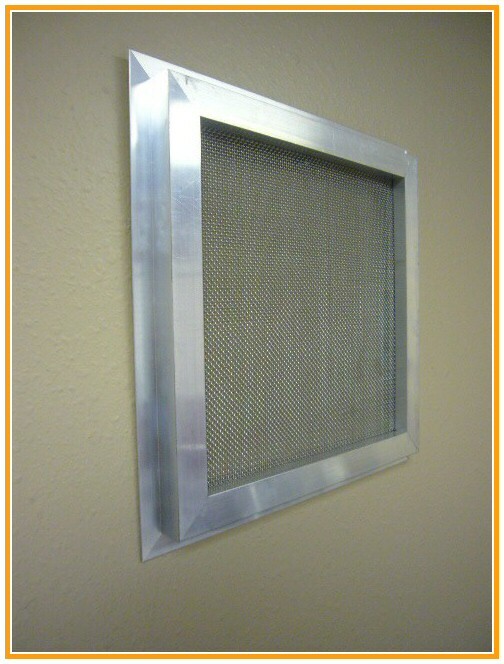 It is available in either .018, .023 or .028 gauge and is all 12 X 12 stainless steel mesh. The wire can also be painted for an additional fee. Another option instead of stainless steel mesh is perforated metal. Standard warranty is one (1) year in workmanship and Materials from the date of purchase.